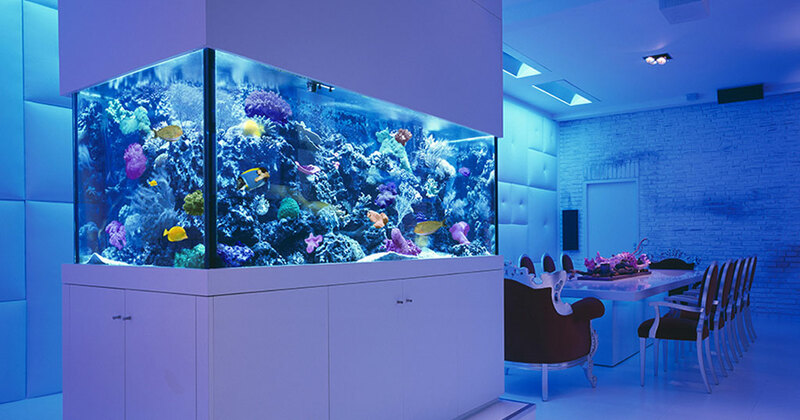 Aqua-Tech manufactures custom designed aquariums and is the country's leading specialist in contemporary bespoke fish tanks which are incorporated into unique pieces of furniture. See our furniture aquarium coffee tables, wall hanging picture aquariums, bars, counters, column tower aquariums up to 2 meters in height, giant goldfish bowls up to 600mm in diameter, large aquariums cylinders, cubes, semi circles and hexagon tanks with connecting tunnels for the fish to swim through. Aqua Tech UK believe aquariums can enhance the decor of any room. Using new materials and aquarium technology, custom aquarium design is entering a period where the only limitations are the laws of physics and the designer's skill and imagination. That's why choosing the right aquarium supplier is so crucial. The professionals at Aqua Tech UK with 25 years of experience building, installing, and maintaining aquariums. Specializing in creating unique, custom aquarium designs and aqua scapes that blend seamlessly into your new or existing living space including aquariums for your home and beautiful commercial aquarium displays for your restaurant, hotel, office, and other business. No matter where the location, your aquarium will become the living, breathing centerpiece of the room. All aquariums, fish tanks and accessories can be delivered to anywhere in the UK or abroad or we can install for you complete with fish, plants and decor to your own design from our Manchester branch. The majority of our furniture aquariums are constructed in easily maintained acrylic which is lighter, stronger and clearer than glass and algae resistant with no unsightly seals, seams or edges. Our furniture aquariums can be custom designed for both domestic or commercial installation with optional maintenance contracts.